Mountain Hardwear hits the reset button for 2019, harking back to its alpine roots. From tents to packs to sleeping bags, nothing on its equipment line goes untouched for the reboot. We joined the brand on the Grand Teton to get the story. The wind gusts upward of 40 miles per hour, spitting graupel off the overhead rock and onto our backs. 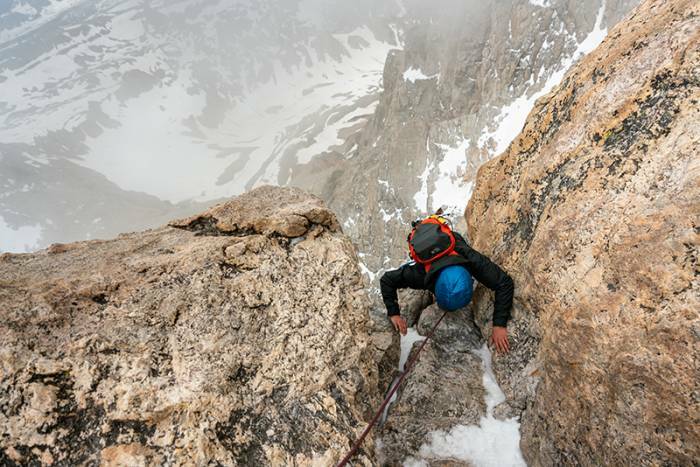 Tucking my chin, I pay out rope as the guide climbs around the corner beyond my sight. I’ve joined a team from Mountain Hardwear and Jackson Hole Mountain Guides on the Grand Teton to get personal with Mountain Hardwear’s revamped 2019 lineup. And man, it’s like drinking from an alpine firehose. I dust the snow off my gloves, ready myself, and ascend into the maelstrom of gray and granite. Next spring, Mountain Hardwear will release its updated (and closely guarded) alpine equipment kit. The entire equipment line has been revamped — tents, packs, sleeping bags, and clothing. Everything. Mountain Hardwear was founded by a group of renegade designers passionate about the mountain. But along the way, the brand dabbled in backpacking, slackline, trekking, and hiking. Mountain Hardwear strayed away from its alpine roots, and, in the mind of new President Joe Vernachio, “thinned” the brand. Nothing triggers product managers’ enthusiasm more than carte blanche from the boss. They had a backlog of ideas, a stack of athlete feedback, and endorsement from the top. With those, Mountain Hardwear took a hard look at what it does best, staffed up on designers, and realigned behind a unified vision. Mountain Hardwear set out to stop chasing what other brands were doing and instead recommit to its core: building the best alpine climbing equipment it can envision. To shorten the timeline, the brand took a year off from producing sales samples. Instead, it used the extra time to develop, refine, and test its new line of alpine-centric prototypes. Mountain Hardwear will present its latest product innovations to the public at Outdoor Retailer at the end of the month. We got a chance to get up close and personal with the 2019 alpine kit on the Grand Teton earlier this month. The results are exciting and fresh — more like what you’d expect from a young, energetic startup than a venerable mountain brand. Here’s a peek at what you can expect to see. When Mountain Hardwear launched in 1993, its flagship product was a sturdy, geodesic dome tent. Some 25 years later, the Trango is still widely accepted as the pinnacle alpine shelter and is a favorite of guides and ambassadors. 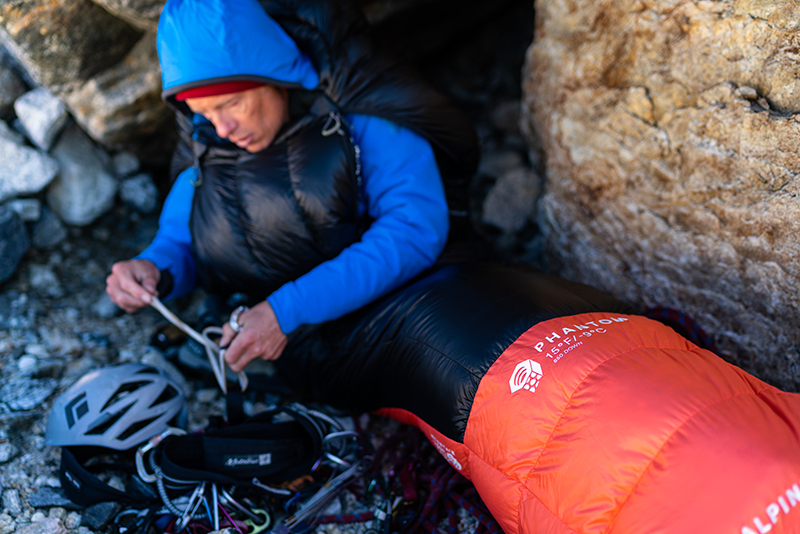 When outdoor professionals caught wind of the 2019 revamp, they were quick to advise, “Don’t mess the Trango up!” For 2019, Mountain Hardwear makes a few key shelter upgrades, brings back a favorite, and releases something new. Trango fanatics will take satisfaction in knowing the Trango remains largely the same, keeping what was good and incorporating a few key upgrades. Most recognizable, instead of vaulting the fly from the outside, the vestibule pole runs inside the fly, which proved to offer greater stability in wind tunnel testing. And the door now unzips in a wide “D” shape and stows quickly to the side — instead of dangling from the center, falling into the climber’s way. 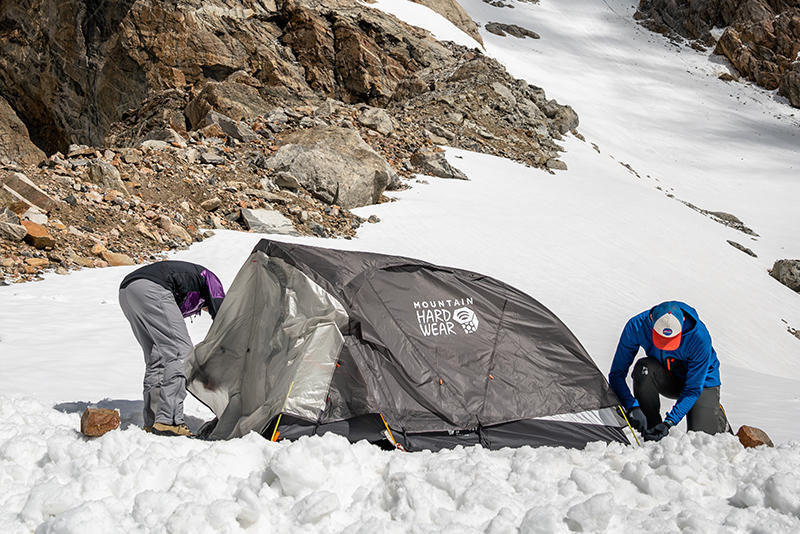 If you’re still mourning the loss of the venerable EV single-wall, high-altitude tent series, you’ll be happy to hear Mountain Hardwear is bringing it back! Sort of. Ed Viesturs (EV) may have moved on, but the AC line improves on the old. Unlike the EV, the AC uses sleeves (over the clip setup) to increase stabilization and help simplify assembly. Color-coded webbing at the stakeout points helps expedite setup as well. The vestibule is integrated into the three-person model, while the two-person version cuts a little weight by making the vestibule an aftermarket option. The decision is yours. Sitting somewhere between the Trango 2 and AC2 (and branching more into three-season creature comforts) is the spacious Outpost 2. The Outpost has a prominent brow at the front door, making tent-bound chores a little easier. The Outpost also sports a dual mesh canopy and mesh doors for better ventilation. And the removable fly has an attached vestibule for an extra room and maximum storm protection. 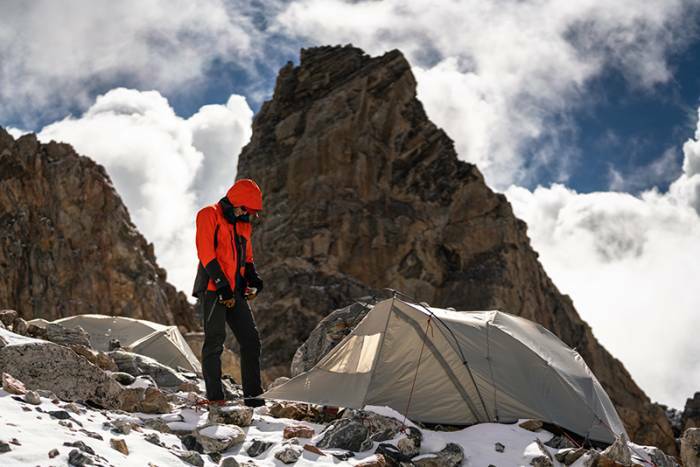 Also worth noting is that, for 2019, amidst growing concerns about the potential health and environmental impacts of chemical flame retardants tents, Mountain Hardwear decided to begin sourcing tent materials without chemical flame retardants. The switch may not adhere to CPAI-84 specification for flame-resistant materials used in tents. Superlative development starts with sourcing tip-of-the-spear materials. 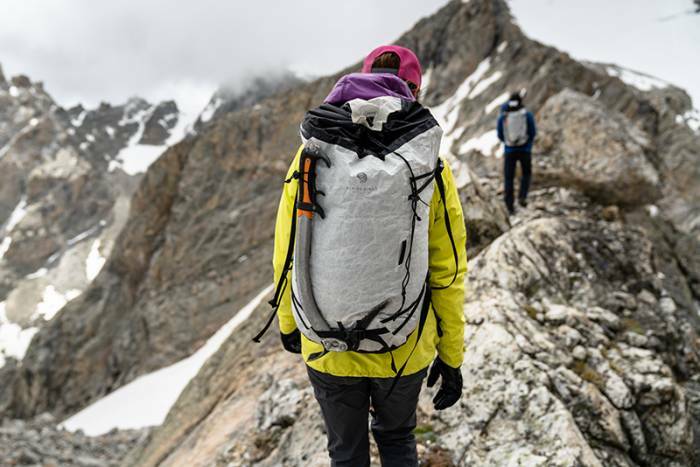 Mountain Hardwear integrated the latest in material sciences into its equipment lineup and uses it judiciously in its new line of packs. Climbing-specific accouterments pair with the materials to provide bomber durability, pure function, and handsome looks. Dyneema has been dubbed “the world’s strongest fiber,” with a tensile strength reputedly 40 percent stronger than Kevlar and 15 times stronger — and seven times lighter — than carbon steel. It’s hydrophobic and highly resistant to sun exposure. In other words, it’s perfect for the alpine world and the material of choice in Mountain Hardwear’s bellwether pack, the Alpine Light. The brand stripped down the Alpine Light for hard routes, with little wiggle room for failure. The simple pack comes with lash points, straps, and a rope keeper. And a removable framesheet reduces the pack to fighting weight when the going gets vertical. The Multi-Pitch is built with the rock hound in mind. The pack’s material is a combination of X-PLY (used in sails for light weight and superior strength) bonded to X-10 cotton canvas and backed with a 0.5-mil polyester film that won’t flake off. The entire pack rides over a durable Kevlar bottom panel. The Multi Pitch is a rope gun’s top-loader. Hang the pack at the belay and flop the lid over to reveal a pair of internal gear loops. This keeps the rack clean and organized instead of slumped at the bottom of your pack. A pair of deep front pockets can swallow that guidebook, map, or leftover pizza. The amalgam of materials and design features yields a waterproof cotton that’s both durable and surprisingly supple, built to last a lifetime. Though we didn’t see it, Mountain Hardwear is also releasing a Crag Wagon pack. 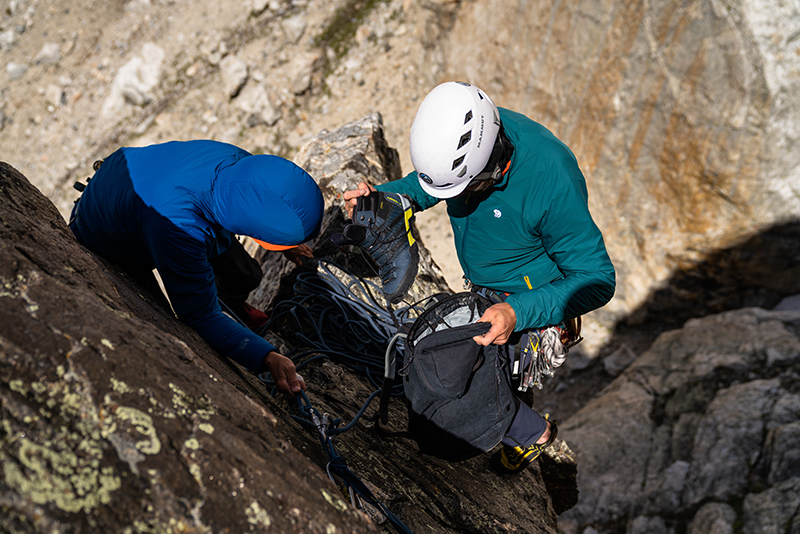 It leverages the same materials found in the Multi Pitch but has a yawning, front-loading U-Zip zipper, providing quick access to your entire rack. Mountain Hardwear designers also got their creative mitts on the brand’s popular summit/weekend pack, the Scrambler. Smaller, lighter, and customized with thoughtful climbing-specific accouterments, the Scrambler 25L (tested) and 35L feature a new sailcloth technology waterproof fabric and sport a pair of handy side pockets. The pack also has a floating (and removable) lid, an internal gear loop, and a set of forward-angled gear loops, which ensure the rack always stays within reach. I found the 25L a perfect companion to carry on a walk in the park — even way up high in Grand Teton National Park. Offset baffles, anti-snag zippers, tailored cut, ergonomic collars, contoured foot boxes: A lot of thought went into designing a better night’s sleep this season. The design team’s long hours show in Mountain Hardwear’s Phantom Alpine. Most sleeping bags have either a left zip or a right zip, or even a middle zip. None of these offers a great solution for tending to camp chores and staying warm while tethered to a wall on a small climbing ledge. The Phantom Alpine solves this by using a pair of half-length zippers, one running down each side. Simply poke your arms out, zip up under the arms, and your hands are free to cook or sort gear and stay warm under the shelter of 850-fill down. Does the gear we saw have application beyond the steep slopes and granite walls? Sure, consumers could use the gear off the mountain and on the trail. But the designs in these styles will intentionally be alpine and reemphasize the “mountain” in Mountain Hardwear. 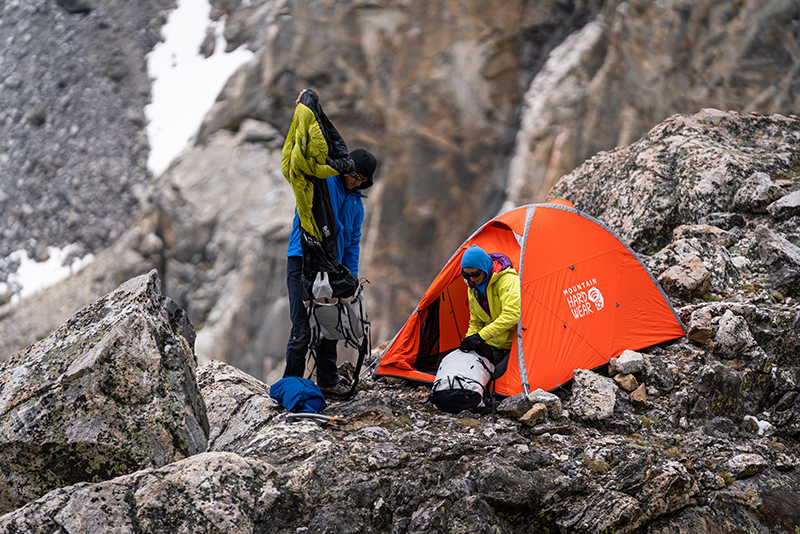 Like the route to the top of Grand Teton, Mountain Hardwear’s route to its 2019 alpine lineup wasn’t predictable — or pedestrian. But, like the Exum route, it’s a classic that delivers.